Falcon Windows: the repairer of choice for all types of conservatories in Ipswich Suffolk and Essex. Leaks, knocks, wear and tear - no matter how careful you are with your conservatory, orangerie or garden room, it's a good idea to keep on top of the maintenance of your investment. Just by giving your conservatory a bit of TLC from time to time, you can keep it in the best possible condition. And of course, if you notice any damage or leaking, perhaps as a result of adverse weather conditions or ball games in the back garden, it's always best to get it checked over immediately . If you're experiencing problems with a leaky conservatory roof or conservatory boxed gutter in the Ipswich or Suffolk area, Falcon Windows are well worth a call. 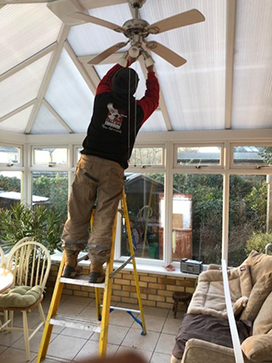 We're experienced conservatory leak repair specialists, able to repair all types of conservatory leaking issues - and what's more, we're one of the very few companies around Ipswich and Suffolk who actually take on this type of work. Our friendly professional tradesmen have many years of experience in solving leaks on conservatories, orangeries, garden rooms. We will come out on site to take a look at the issue, provide a full written quotation in 48 hours and offer advice on how one can help prevent leaks to your conservatory in future. We give honest and straightforward quotations without any gimmicks. Decide to proceed, and we'l then carry the work out within 2 weeks. Call us on 01473 288690 Emergency repairs: 07887 525155 or email eamon@falconwindows.com. Please have the following information to hand for us to swiftly deal with your conservatory repair or leaking conservatory roof or conservatory gutter repair enquiry. What direction is the wind blowing when you're experiencing the leak? Where is the location of the leak, viewed from the outside? How often does it leak for, and if it only leaks periodically, when does it occur? How old is your conservatory? Did you get an initial guarantee with the conservatory and how many years are left? At Falcon Windows we are specialist repairers in leaking conservatories. 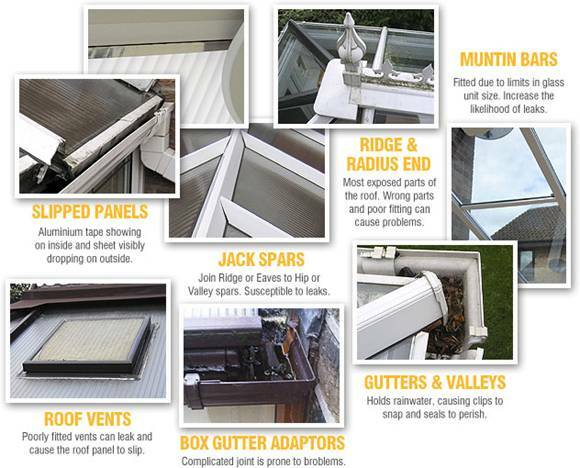 Slipped panels, ridge and radius end issues, leaking around mutin bars, jack spars, roof vents, blocked or defective box gutters and valleys - we know the weak spots and how to mend conservatory leaks quickly and effectively. Above all though, we want to correct the leak once and for all - to give you real peace of mind - and that can mean sometimes going back to basics and stripping the roof back until we find where the water is coming in. 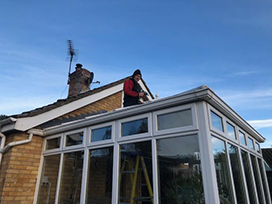 Each leaking conservatory or conservatory boxed roof repaired in Ipswich, Suffolk and north Essex by the Falcon Windows team sees the use of only the best available materials on the market that allow us to do the job properly. We always keep value for money and our reputation in mind and deliver a professional and reliable finish. All repair work undertaken is fully guaranteed for your peace of mind. Damaged conservatory panes or panels? 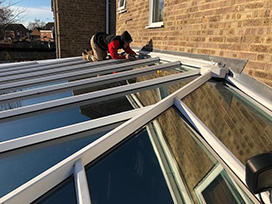 At Falcon Windows Ipswich, we'll come on site and suggest the most practical and cost-effective way to restore your damaged conservatory to its former glory. It may be a case of replacing one or several roofing sheets, a panel or unit. Accessing panels can be time-consuming and often things like guttering and ring-beam coverings have to be removed before removal and re-installation is possible. As specialist repairers of damaged conservatories, we will provide sound advice and an honest quotation, so that you have what you need if you are taking things up with your insurance company or can make the decision about your conservatory repair in your own time. The conservatory repair pictures on this page show work on an Ultra Light 500 conservatory roofing system which was repaired after being damaged by freak hailstones. On this occasion, every roofing sheet had sustained damage. The owner was able to place an insurance claim for the work to be undertaken at an agreed quotation. For this Ipswich conservatory repair, firstly the guttering had to be removed by the Falcon Windows team, along with the front ring beam hard plastic covering. The rear underside wall-plate covering and screws had to be taken out as well to enable access to the roof sheets. Normally the metal joining strips come out too. The new roofing sheets could then be put in place and the metal joiners re-installed, before finally the wall-plate undercover ring beam covering and guttering were put back.